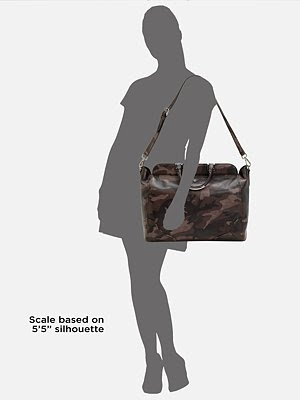 While I love just about everything in the name of fashion, I've never really been big on the whole camouflage thing. I do like it on other people, and will admit, that I've held a few pairs of cargo pants in my hands on occasion, but never really made it to the dressing room with them. I am however, on the lookout for a "military green" jacket and pants, which should be easy to find, since that's one of the hottest trends these days. 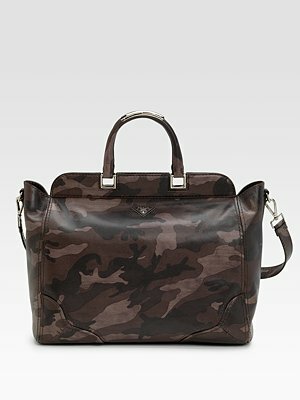 After seeing this gorgeous bag from Prada, I'm thinking that I could work with a camouflage accessory of some sort. If this is any indication of where the accessories trend is headed for the upcoming season....I'm definitely on board! I can see this being on of fall's "it bags," which is further evidenced by the fact that Saks will only allow the purchase of three within a 30-day period, due to high demand. While it's hotter than hot, I don't think I could let go of $2495 for it; I'll keep an eye out, I'm sure I'll run across something!